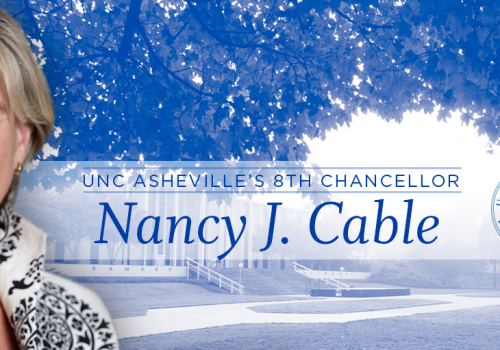 A nationally recognized leader in higher education, educational access, financial aid and affordability, and liberal arts and sciences curricula, Dr. Cable is the eighth permanent chancellor of the University of North Carolina at Asheville. She served as Dean at Denison University from 1977-1986, Guilford College from 1986-1991, and Vice President and Dean of Admission and Financial Aid at Davidson College from 1991-2005. Together with Davidson trustees, faculty, staff, and student leaders, she helped to lead efforts to advance selectivity, diversity, financial capacity, and to implement a strategic plan that advanced Davidson College’s standing as one of the strongest liberal arts colleges in the U.S. From 2005-2009, she served as Vice President for Development in the College of Engineering at the University of Virginia and later with UVA’s Semester at Sea Program. Following three years of service as Bates College’s Vice President, the Bates College Board of Trustees elected Dr. Cable as Interim President, a position that allowed her to help lead college wide efforts on governance, faculty and curricular issues, and matters of diversity and inclusion. Prior to becoming chancellor of UNC Asheville, Dr. Cable served as president of the Arthur Vining Davis Foundations.